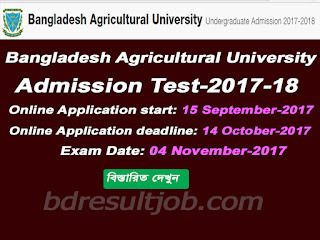 Bangladesh Agricultural University Admission Test Circular 2017-2018 has been published on http://www.bau.edu.bd/. Bangladesh Agricultural University Admission Test Circular 2017-18 will be the beginning date of 15 September to 14 October, 2017. Bangladesh Agricultural University Admission Test Circular 2017-18 and Admission related all information will be found in Bangladesh Agricultural admission Official website at http://admission.bau.edu.bd/. 5. Admission Test date: 04 November, 2017 at 11:00am to 12:00am. e. Must have Physics, Chemistry, Mathematics ( SSC General Math) in Both of SSC and HSC and Biology in additional subject. Every eligible candidate can apply Bangladesh Agricultural University, Mymensing by two method. Apply online visit http://admission.bau.edu.bd and fill up the application form. After successfully apply there an auto Bill Number will be generate for application to Pay admission test fees. Reserved this bill number to pay application fee. 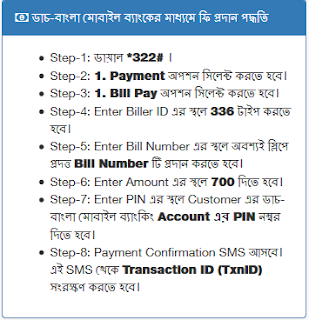 Bangladesh Agricultural University SMS system below instruction. MMS <space> BAU <space>SSC Roll <space> SSC Registration Number <space> SSC Passing Year <space> First Three Letter of Your Board Name <space> HSC Roll <space> HSC Registration Number <space> HSC Passing Year <space> First Three Letter of HSC Board Name <space> Quata Keyword (if applicable) and Send it to 6969. After sending SMS, Return SMS send a Bill Number. Note this bill number and pay the bill from DBBL Mobile Banking. b. Select 1 for Bill Pay. c. Input Biller ID as 336.
e. Input 700 as Amount. f. Input your PIN Number of DBBL and Complete the payment. g. After complete the Payment please note the Transaction ID. Subject: Physics, Chemistry, Mathematics and Biology. b. Question Type is MCQ. c. For Each Wrong Answer 0.25 Marks will be deduct. BAU authority will published 12,000 Candidate Eligible list for Admission Test on 19 October 2017. Download Eligible list here. 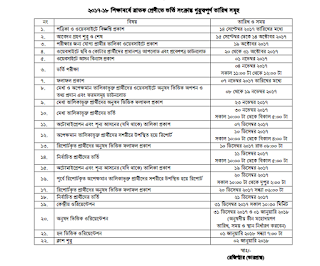 Bangladesh Agricultural University (BAU) 20 to 31 October can Download Admit Card. You are 12,000 listed candidate you can download http://admission.bau.edu.bd/ by upload a passport size color Photograph within 50KB. After download Admit card you must candidate sign in the spot. 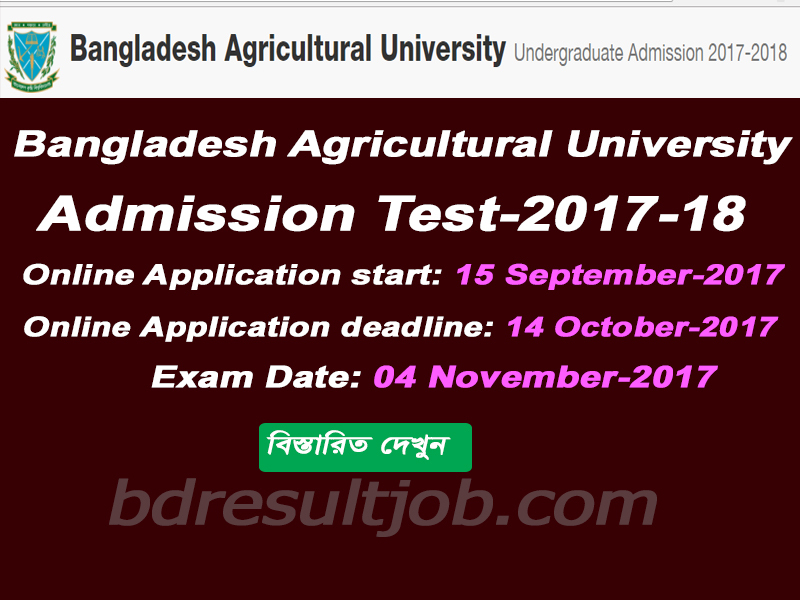 Bangladesh Agricultural University (BAU) Test admission authority will published http://admission.bau.edu.bd/ on 1 November 2017. 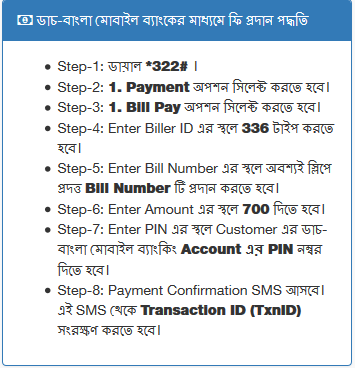 Also, you can found below SMS system. 7 November 2017 will published Admission Test Result. Any applicant can download and view from BAU official website http://admission.bau.edu.bd/ search their Admission Test Roll Number. Tags: admission bau edu bd, Bangladesh Agricultural University, Bangladesh Agricultural University Admission Circular, Bangladesh Agricultural University Admission Test Result, BAU Admission Circular, BAU Admission Notice, BAU Admit Card Download, BAU Seat Plan, BAU Admission Mark Distribution, Bangladesh Agricultural University Mark Distribution, BAU Admission Test Result. Bangladesh Agricultural University (BAU) Admission Test Circular 2017-2018,Bangladesh Agricultural University Admission Circular, Bangladesh Agricultural University Admission Test Result,Bangladesh Agricultural University Mark Distribution, BAU Admission Test Result.